Isaac Balami, Chief Executive Officer of the company said, the MRO is operations-ready to handle Boeing 737 Fleets, and also stock a comprehensive spare parts inventory marketplace to be made available to airlines in Nigeria and across the West and Central African region. Balami, who decried the high cost of maintenance of aircraft by airline operators in the region, said relief has come to the aviation sector, urging operators to take advantage of the opportunity. Former President of about Eight years standing of the National Association of Aircraft Pilots and Engineers (NAAPE) – while serving as a senior manager at Aero Contractors – Balami Handed over in NAAPE and resigned in Aero to focus on the MRO, He firmly believes that with the granting of “Approved Maintenance Organization” to operate that millions of dollars will be saved for airlines and while also greatly reducing capital “flight”. Additionally, foreign airlines local currency accounts will encourage their engagement with 7 Star Global. Maintenance services, Balami disclosed, will also be available in Abuja in a few weeks from now, delivering cost reduced international class services. Our new Hangar in Abuja can take two Boeing 737 at the same time. According to the CEO, some of the experts in the organisation have worked for more than thirty years in the Aviation Sector, at local and international levels. Furthermore, our technical partners from Jordan, USA and Europe bring more than 50 years combined so operations in Aircraft heavy maintenance, ranging from C-D Checks to aircraft paintings amongst a broad cross-section of related services. 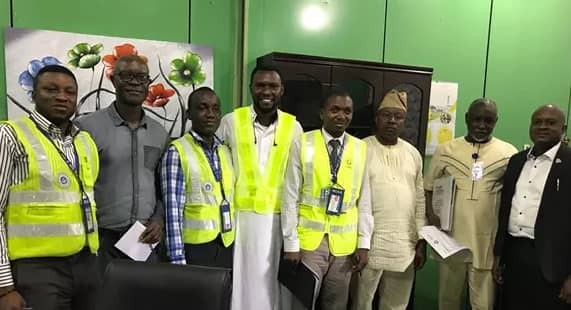 The Accountable Manager Engr Ibrahim Nock also spoke saying that 7 Star is coming at a time when it is truly needed in the country stating that the national carrier fleet are encouraged to take advantage of our facility, to generate jobs for the vast number of talented but jobless engineers across the country. This is also an opportunity to stretch the best Aviation Engineers at home and across the Diaspora- many of whom have made up their minds to return home to support the great efforts of the Aviation Minister, with the support of our President.